President Barack Obama empaneled a new task force led by Vice President Joe Biden to develop comprehensive proposals to address gun violence no later than next month. In the wake of last week's shooting at an elementary school in Newtown, Conn., the president announced a new initiative that would include members of his cabinet and outside organizations to generate proposals to rein in gun violence. He said that any effort should include new restrictions on guns, but also improved access to mental health services and better management of violence in popular culture. Obama vowed that the new task force would not be just another Washington commission, shorthand for the groups sometimes tasked with studying an issue or event but which often delay or dilute solutions long past the time when the original impetus for such a panel has passed. President Obama announced Wednesday that Vice President Joe Biden will be developing proposals to curb gun violence, some of which may include banning military-style assault weapons and high-capacity gun clips or magazines. NBC's Pete Williams reports. Obama said he had asked Biden "to lead an effort that includes members of my cabinet and outside organizations to come up with a set of concrete proposals, no later than January," which the president would then push "without delay." "This is not some Washington commission. This is not something where folks are going to be studying the issue for six months and publishing a report that gets read, and then pushed aside," the president said. "This is a team that has a very specific task: to pull together real reforms, right now." Obama expressed support -- restating the position of his press secretary, Jay Carney -- for certain gun measures, including the assault weapons ban, limits on ammunition and closing a loophole allowing gun buyers to elude background checks at gun shows. But he stressed that those were only components of a broader effort to address violence. The president suggested that stakeholders in those deliberations could possibly include the National Rifle Association -- the gun rights group that had gone silent in the wake of the Newtown shooting, but will hold a press conference on Friday. The president argued that mothers and fathers who compose the NRA's membership had also been impacted by the Newtown shooting. 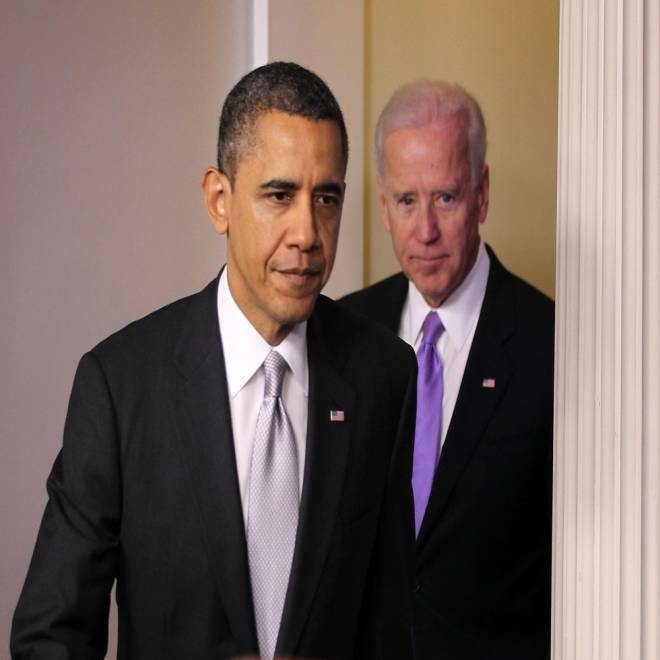 President Barack Obama and Vice President Joseph Biden arrive at an announcement on gun reform in the James Brady Press Briefing Room of the White House December 19, 2012 in Washington, DC. "Their task is going to be to sift through every good idea that's out there, and even take a look at some bad ideas before disposing of them," Obama said of the task force's efforts. Already, Democrats on Capitol Hill have started to initiate some gun control efforts in the aftermath of Newtown. House Minority Leader Nancy Pelosi, D-Calif., called Wednesday for Republicans to bring up a vote on high-capacity ammunition magazines by this weekend. And West Virginia Sen. Jay Rockefeller, D, introduced legislation to study the impact of violent video games on children. Additionally, Sen. Dianne Feinstein, D-Calif., has said she'll bring up a bill to reinstate the lapsed ban on assault weapons of the first day of the next Congress. Few Republicans have stepped forward to embrace any of these gun measures, though, and have focused instead on the need for improved mental health services, or school safety. Obama said his task force's proposals would make up part of his State of the Union address, and he expressed hope that the searing images from last week's shooting in Connecticut would last in the public conscious and help advance his eventual proposals. "I would hope that our memories aren't so short that what we saw in Newtown isn't lingering with us -- that we don't remain passionate about it, only a month later," he said.